The function of the painter is not any more to make images, but to report a vision which belongs to him solely where from the confusion, the style and the personality. She's not monostylistic, she\'s polymorphic ! 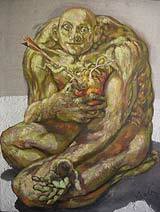 The figurativ painting represents less that it expresses. The painter has to accept that colors and his material, establishing a picture, more than his thought, suggests the sense of a painted work. Only stays the enjoyment of the track colored on the painting which passes on the reality of the picture. The tools of the painter, the frame, the painting, pigments mixed in the sociable disposition become the subject of the painting. Essence is not any more that work is new, but that it contains the vibration of the alive one. Not to limit nor to restrict the contents and the range of the matter painting, it is necessary for us to refuse to have a STYLE ! Is the style "Picasso" what it really ? It changed some four times per day ! Sorry, for the in love ones with the monostyle, I learned my trade and I can choose... And I benefit from it a maximum. Painting is an inhabited, immense and mysterious world ! Based on the richness of the secrecy, that the painter must preserve preciously and visit daily !